"There are many people suffering from [irritable bowel syndrome] around me. The cause is said to be stress. Because it does not occur only in other people, I am worring about it. I think that there are many people suffering from this syndrome. Could you give information about it on your home page, please?" So, I will explain "irritable bowel syndrome" (abbreviated to IBS hereafter). IBS is more often observed in white-collar workers than in blue-collar laborers, and in city-dwellers than in country people. Abnormalities in intestinal motion are classified into diarrheal, constipated and alternate types. The alternate type shows alternate repetition of diarrhea and constipation. Abdominal pain typically occurs in the left lower abdomen. Usually, these symptoms are irregularly repeated. Symptoms caused by gas such as flatulence, belch and borborygmus are often observed. As systemic symptoms, autonomic imbalance such as headache, stiffness of the shoulders, insomnia, sweating and palpitation are observed, but these symptoms are not specific to IBS but part of its symptoms. All patients with autonomic imbalance do not complain of abdominal symptoms. IBS is considered to occur in people who are likely to have imbalance in the autonomic nervous system and who are susceptible to intestinal reactions. Since symptoms in the digestive tract easily occur in IBS, patients are afraid of eating and become undernourished, causing the delay of treatment or aggravation of symptoms. Diet therapy appropriate to disease conditions should be strictly performed, but it is also important not to be too nervous. Would you check your diet? Do you have the following habits? Do you often eat beans, vegetables, seaweeds and fruit? Do you like milk and yogurt? Do you drink coffee, carbonated beverages or alcohol at least once a day? Do you often have Western cuisine? Don't you eat much rice? f you agree with many of the above items, you may eat many irritant foods. Since IBS is a disease which causes abnormalities in intestinal motion, you should avoid foods irritant to the colorectum. 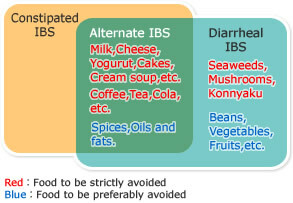 The following figure shows the food that you should strictly or preferably avoid in eating depending on the IBS type. Here, I will explain constipation. In most cases, constipation is caused by hypofunction of the colorectum. On the other hand, constipation in IBS, which is called convulsive constipation, is caused by high pressure in the intestine resulting from excessive intestinal motion in contrast to ordinary constipation. Therefore, cold milk and vegetable fibers, which are effective treatments for ordinary constipation, could aggravate constipation in IBS. For the same reason, much use of cathartics is likely to cause abdominal pain in constipation in IBS. Therefore, medicine for digestive function is more effective than cathartics in constipated and alternate IBS.